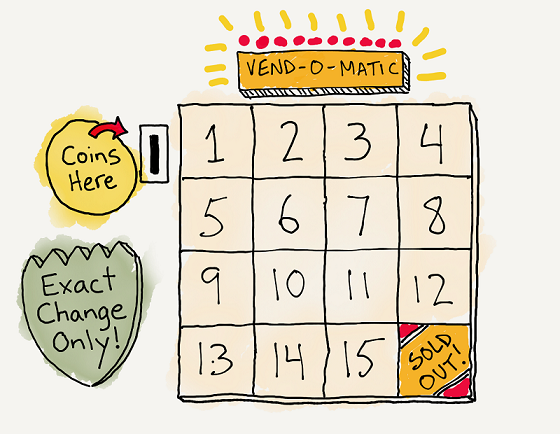 In this activity, students will explore the concept of binary numbers by experimenting with a very odd vending machine that only accepts Base-2 coins and doesn’t give change! 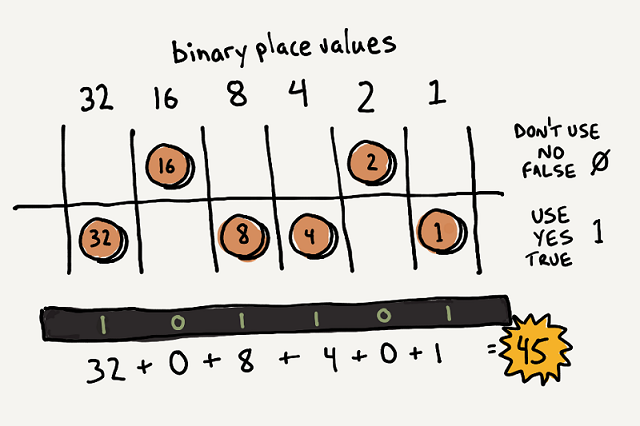 In the process, students will become familiar with an alternate numbering system, in this case binary (Base-2). Students will learn how binary relates to decimal, and will be able to convert between the two systems. Gather or create small counters or ‘coins’ in the following denominations: 1, 2, 4, 8, 16, 32 Plastic white poker chips work well as coins. You can write the denominations onto one side of the coins with a whiteboard marker. You can also use small index cards or paper squares. Make sure to leave one side of each coin blank. Amount: One set of coins (with one coin of each of the first four denominations in it) for each student or each pair of students. Hold onto the 16 and 32 unit coins for later. If you have time, create on a poster board, on the whiteboard, or on paper as a handout, a big rectangle representing a vending machine. Draw in different items for purchase that would appeal to the students. Have the different items priced differently from 1 unit to 15 units. This is particularly good to have for younger and more visually oriented students. Have any of them bought anything in the last 24 hours? Usually they have bought a snack or perhaps lunch. Did any of them use cash? What bills or coins did they use? What are the core denominations of money in the United States? Lead the students to realize that our core monetary denominations, like our number system are based on ten. Our money system is based on our number system, the decimal system. The deci- prefix means ‘one tenth’. Each place value in the decimal is one tenth of the place value to its left. Example: The amount eleven is written in decimal notation as 11. There is a numeral one in the ‘tens place’ and a numeral one in the ‘ones place’. The leftmost numeral one in the ‘tens place’ represents one ten. The next numeral one represents an amount that is one tenth the amount of the place value to its left; in this case, one tenth of ten, or one. But what is it like to use a different monetary system? A monetary system that has a base other than ten? You have one of each coin: 1, 2, 4, 8. What else can you buy? What coin(s) would you use to do this? What is the price of something you cannot buy, because you don’t have exact change? Here is where students will start to figure out the different combined sums of different coins. You can also prompt them by saying, for example, “It’s impossible to buy something that costs 11 units, isn’t it?” Someone will immediately point out that you CAN buy an 11-unit item with 8 + 2 + 1. You can now have the students write down how they could pay, what coin(s) could they use to purchase each of the items priced 1 unit through 15 units with the coins they have OR have a whole class discussion with you keeping track of their methods of payment on the whiteboard. There is only one way to make each of those amounts. Have students line up the coins in their set from greatest to least denomination, left to right. What do you notice about the denominations as they increase from right to left? Each amount is double (or times 2 or twice) the denomination before it (to its right). If we added one more coin to your set of coins that is greater than the 8 unit coin, what is the next logical coin denomination? 16. Why? Because 16 is ‘2 times’ greater than 8. Hand out the 16 unit coins, one to each student or pair of students. What combinations of coins can you use to pay for an item priced from 16 units to this new maximum price? Once again, you can now have the students write down how they could pay, what coin(s) could they use to purchase each of the items priced 16 units through the new maximum price with the coins they have, OR have a whole class discussion with you keeping track of their methods of payment on the whiteboard. You can make every amount between 16 units and the new maximum with the 5 coins now in their set. If we added one more coin to your set of coins that is greater than the 16 unit coin, what is the next logical coin denomination? 32. Why? Because 32 is ‘2 times’ greater than 16. Hand out the 32 unit coins, one to each student or pair of students. What combinations of coins can you use to pay for an item priced from 32 units to this new maximum price? With their coins in a line in descending order from right to left on a piece of paper, ask students to represent a given number by keeping face up the coins they would use to make this amount and flipping over or putting face down the coins not used. Example: Ask them to represent the number 45. See image above. They should have the 32, 8, 4, and 1 coins face up and the 16 and 2 coins face down. Ask the students to place a numeral 1 above the coins that are face up and a numeral zero over the coins that are face down. Practice translating numbers from Base-10 to Base-2 The students can now use this same method to translate other numbers from Base-10 to Base-2. Practice translating numbers from Base-2 to Base-10 Next, have the students use the above method in reverse to translate numbers from Base-2 to Base-10. Start with all the coins face up in a line from greatest to least denomination from left to right. Write the ones and zeros representing the binary number being translated above the coins. Flip to face down any coin with a zero above it. Add up the remaining face up coins.